My extensive (of course!) collection of cupcake cookbooks includes Hello, Cupcake! as well as its followup, What’s New, Cupcake? . 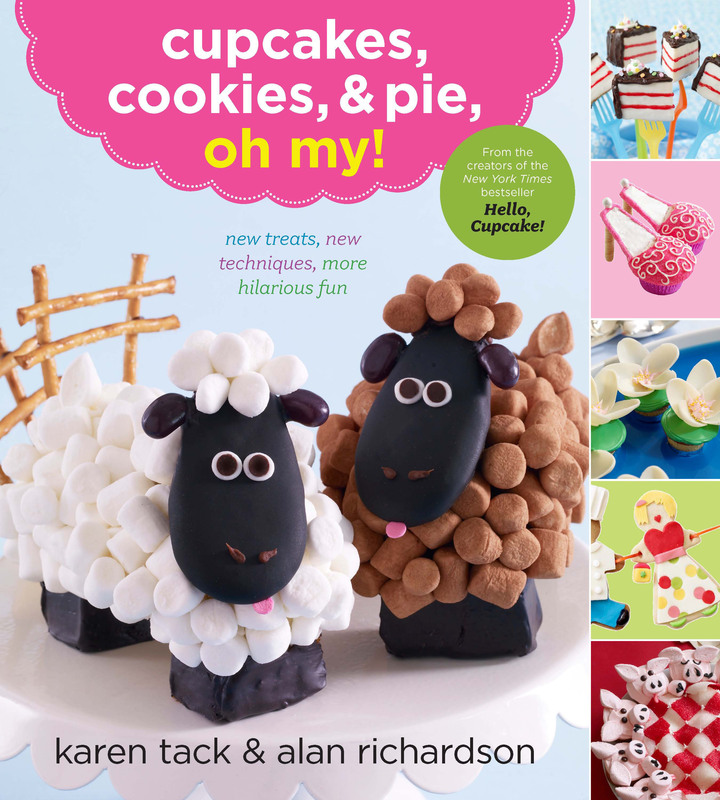 I was planning on ordering the newest book by authors Karen Tack and Alan Richardson when the folks at Houghton Mifflin Harcourt offered to send me a review copy of Cupcakes, Cookies & Pie, Oh, My! . It’s the latest in what has become a trilogy of sorts, and, like the authors’ previous books, it’s inspiring and creative. Tack’s designs are awesome and Richardson’s photos are perfect. In 2008, Hello Cupcake! opened cupcake decorating up to people who didn’t want to become professional dessert makers or invest in an array of pastry bags and metal tips. Instead, Tack and Richardson showed how you can simply snip the corner of an ordinary zip-close plastic bag and strategically squeeze the frosting out that way. They also show, step-by-step, how to combine colors to make marbelized, dimensional-looking animal fur and other effects (the latest: a realistic sock monkey). In this book, the authors branch out beyond cupcakes and into little pies, tarts, cookies and other desserts. Think pound cake puppies, paper doll cookies and Rice Krispies “gingerbread” houses. But there are still plenty of cakes and cupcake cakes, plus the now-ubiquitous cake pops. There’s also a pattern to trace for cupcake wraps or “girdles.” So far, the high-heeled shoe cupcakes seem to be be getting the most attention on Pinterest and elsewhere. I find myself enjoying these books more for the “eye candy,” and have tackled only a few of the actual projects in the book. The steps are clear and the decorations accessible, but some of the projects involve tracing templates, melting chocolate wafers into “glue” and making “candy clay,” and flooding frosting into camoflague patterns. Most don’t fit my definition of “easy cupcakes” — but I don’t think they’re intended to. These projects are definitely doable, though, and great for kids’ parties and other events. One of the most popular cupcakes from the first book was the mock Thanksgiving dinner, complete with (candy) peas and carrots as well as turkey, potatoes and gravy. Cupcakes, Cookies & Pie, Oh, My! includes April Fools recipes as well. 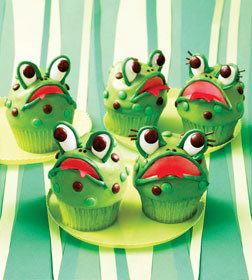 Some of my other favorites include cupcake pigs in a flattened-gumdrops blanket, big-mouth frogs and holiday creations such as zombie cupcakes and a realistic Christmas tree cupcake cake. Cupcakes, Cookies, and Pie, Oh My! is a mouthful — but in a good way. I’m not sure how much I’ll actually end up using the book for making cupcakes, but I’ll definitely be drooling over the images.